The cranberry strips was folder embossed and cut into narrow strips. I cut the labels, the smaller one from patterned paper. 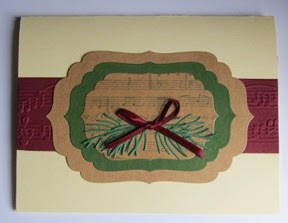 I added die cut pine boughs and tied narrow satin ribbon into a bow. Now that was easy!